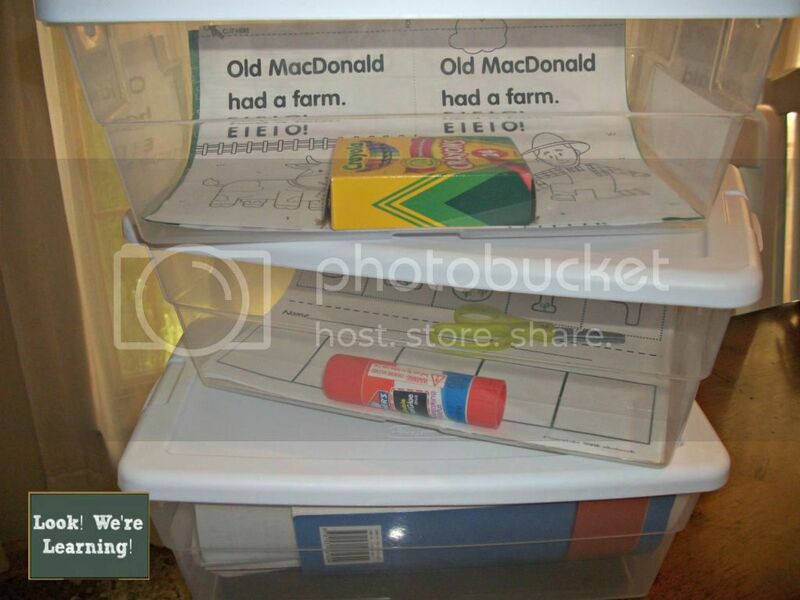 Our Homeschool Workbox Organization - Look! We're Learning! I love workboxes! They’re like little fun boxes that make school work seem more interesting. My kids love using the workboxes. We do our workbox assignments during quiet time, which I’ll talk about in a future post, and that seems to make them feel more “grown-up”, especially since Piglet naps during that time. The first row of our bookshelf holds the kids’ workboxes and the second row is used for workbooks and my reference books for this year’s curriculum. I started using a crate to hold my readers and textbooks for the school year a few years back and I still do. We have a homeschooling closet where most of our curriculum resides, and I just remove what I’ll need each year and keep it next to our dining room table. Once I sort through the books and workbooks, I decide which assignments the kids can probably complete on their own. I put those in their workboxes, along with the materials they’ll need to complete the work. The goal is for them to be able to sit down and complete the work without needing much (if any) help from me. So if there’s a cut and paste activity, I put a glue stick and a pair of safety scissors in the box. If there’s a coloring page, I include a pack of crayons. Believe it or not – that’s not a fake smile. 🙂 They really do enjoy doing their assignments more when I put them in the workboxes. To make it a bit easier to get the assignments started, we keep our school supplies in an over-the-door shoe hanger. I used to keep this in the homeschool closet, which was on the other end of the house. This year, I finally wised up and put it on the back of the laundry room door, which is right next to our homeschool space. 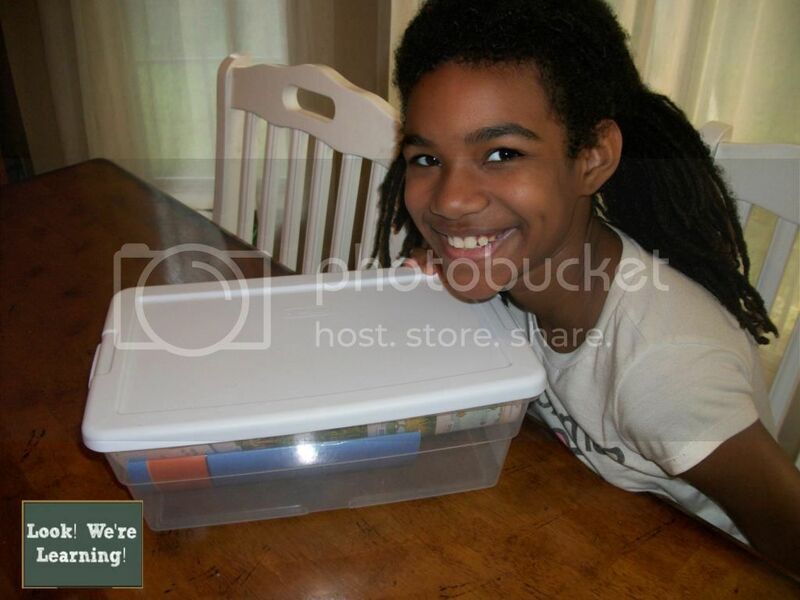 That’s a look at how we handle our homeschool workbox organization! Have you ever used workboxes? 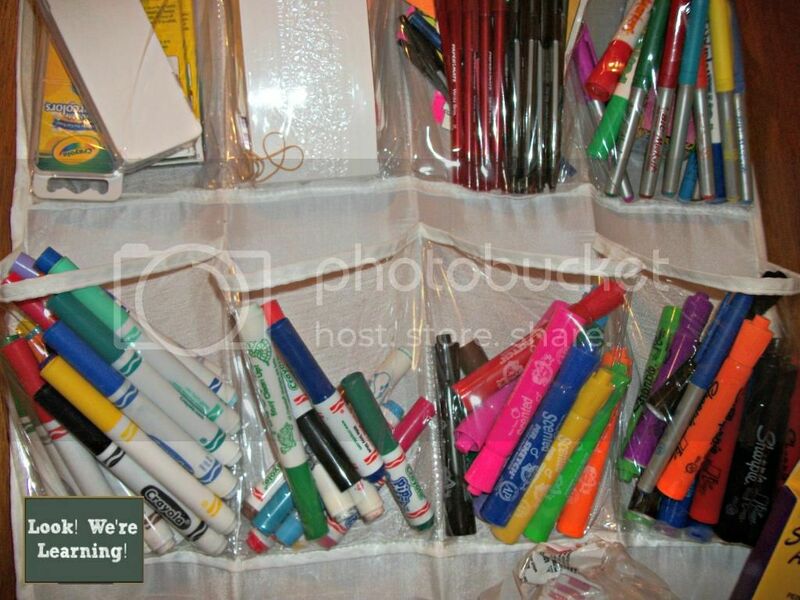 Do they help you to keep your schooling space organized? Share your workbox and organization tips in the comments! 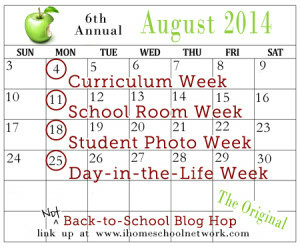 This post is part of the 2014 “Not Back to School” Blog Hop by iHomeschool Network! Stop by to read how our fellow bloggers are getting their homeschool rooms ready for the new year! We’re implementing the workbox system this year too! Yay! I hope it works for you as well! Love the idea of work boxes! This is our first year of homeschooling… So many great ideas out there! Love the idea of work boxes. We also utilize an over the door shoe hanger for our supplies. Isn’t it the best hidden secret! Love it! Popping in from the blog hop. 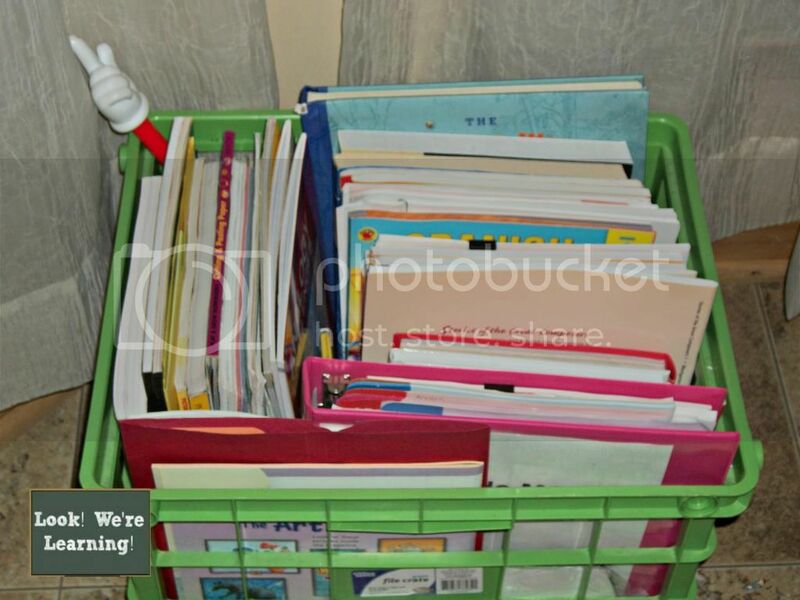 Thanks for sharing, I am in the midst of organizing for the upcoming school year as well. I definitely need to look into workboxes more. My son has ABA therapy and his therapy stuff is a mess. We have tubs/lugs everywhere. I never thought of workboxes for therapy materials. Great idea! I love it! This is so helpful. 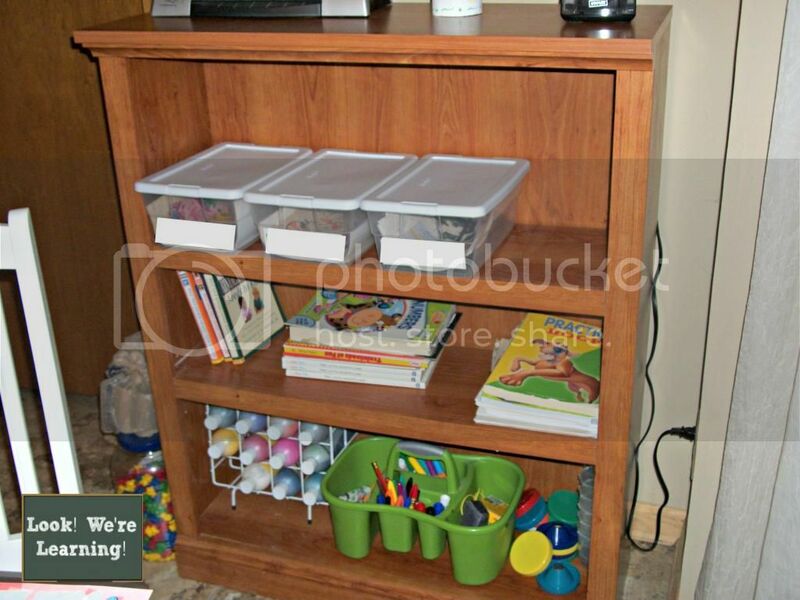 Do you think that a preschooler and a kindergarten could do workboxes by themselves? Any ideas on that? Our kindergartener is using one this year. 🙂 I just put a couple of activities that he can complete on his own in there, like a coloring page and a sight word activity. I usually go over the directions for each one before we get started, but I also keep him nearby while he’s working in case there are any problems. Stopping by from the Shine Blog Hop! 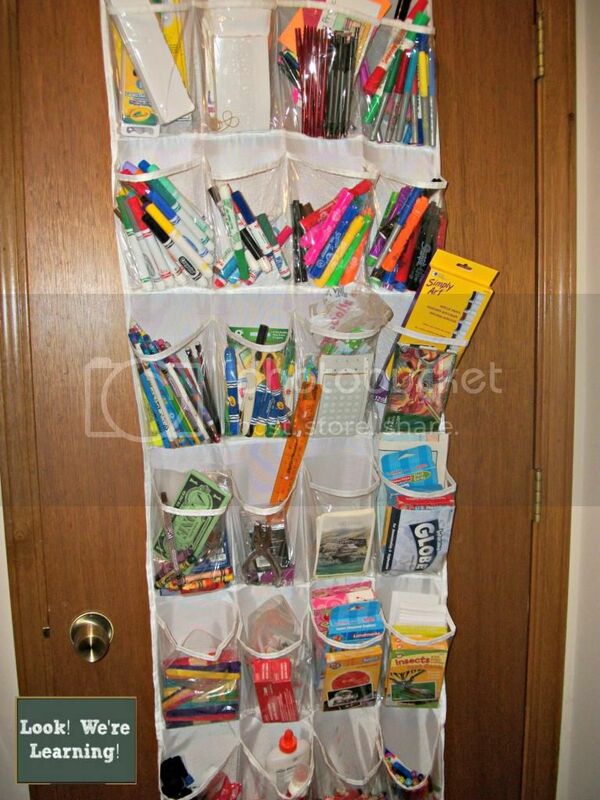 I love your organizational ideas, especially the shoe hanger idea for the school supplies. I was just cleaning out our homeschool cabinets. What a mess! There’s so much in there that just needs to be tossed or passed on to someone else that needs them. I completely understand. I’ve been giving away things from our homeschool closet on the blog for the past year…lol. Thanks for visiting! Lovely idea! I’m in full swing of getting organized for this upcoming school year. i love this planning and organizing part!